Both the padlock and chain are constructed from special hardened steel making them extremely resilient to force, saw and bolt cropping attacks. The padlock itself uses weatherproof internal components that make it ideal for use outdoors and the chain includes a fabric sleeve to prevent scratching to the item it is securing. Please note these sets cannot be made keyed alike since they are pre-sealed at the factory. 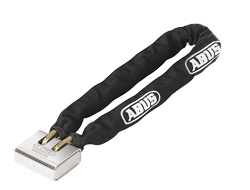 If you need a set of locks and chains where all the locks work from the same key then order your chains first from our Cables and Chains section and then order your locks separately, ensuring you select keyed alike when prompted. We have one sizes of lock and chain set. 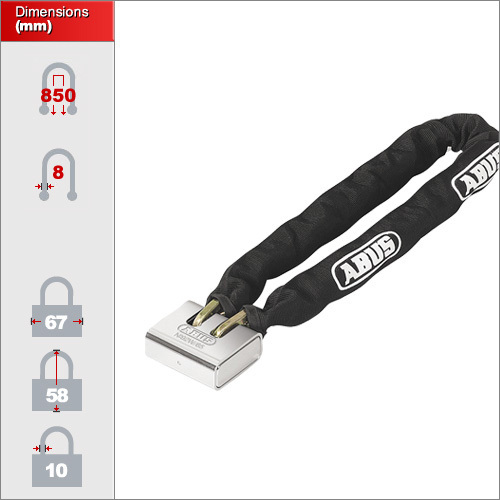 If you require additional sizes then please have a look at our high security chains sold individually and then select a padlock to go with it. The lock comes with two keys. Please note that we cannot make additional keys since these are prepackaged discount sets. If you do need extra keys then either order a lock and chain seperately and add additional keys or order this discount set and have copies of the keys made locally. Most commonly used to secure valuable motorcycles and gates but also ideal for high-end bicycles, containers and storage boxes.